Trailhead is on Mill Brook Road in Stark, NH. Mill Brook Road leaves Rt. 110 7.2 miles east of Rt. 3 in Groveton and 6.5 miles west of Rt. 110A. The trailhead is 4.5 miles down Mill Brook Road. Park on the right side of the road, just after the bridge. The trail enters the woods on the opposite side of the road and the bridge. The Horn, a peak on the ridge extending north from 4000-footer Mt. Cabot and one of the New England Hundred Highest, is the best viewpoint in the mostly wooded Pilot Range. 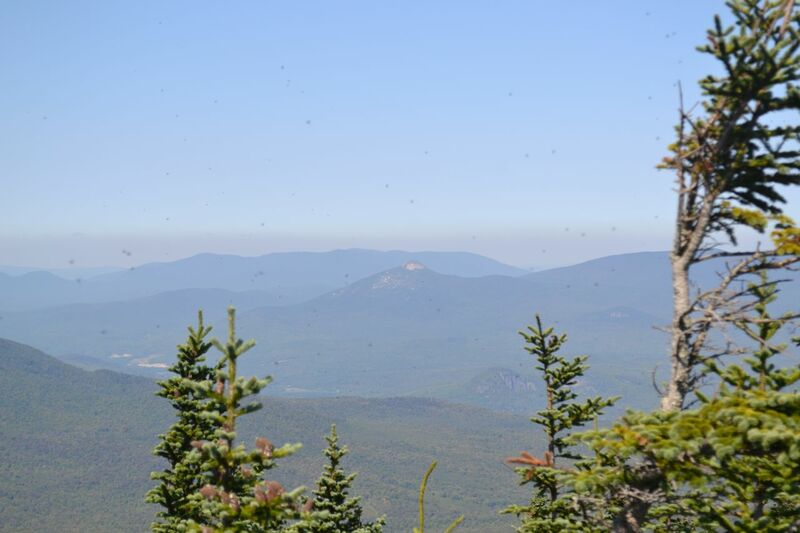 Its steep, rocky summit pinnacle yields wide views of the mountains in northeastern NH, Nash Stream Forest, and Vermont. Along the way, you will experience some the beauty of the Great North Woods, including scenic birch glades and Unknown Pond, with shoreline views of The Horn which make it an excellent example of the hidden gems to be found in ranges like this. Like many hikes north of the more populated areas, this hike begins on a long dirt road. From the small pull-off, walk back down the road to the bridge over Mill Brook. The Unknown Pond Trail begins at a small footbridge and sign on the right side. It follows the brook as it heads into the woods and soon a small cascade is passed. The trail eventually leads away from the brook, beginning a gradual ascent. It climbs through an open forest for a mile before coming upon another brook. The trail then becomes steeper and climbs up the slopes of an increasingly birch-filled forest. Soon, all other trees disappear and the trail enters a beautiful birch glade, especially scenic in afternoon light. After leaving the birches behind, it climbs into a darker forest of spruce and fir trees. After passing through a clearing, it descends slightly to a trail junction near the shore of Unknown Pond, a total of 2.2 miles from the trailhead. To reach The Horn, you must turn right onto Kilkenny Ridge Trail, but for the best view of the pond, bear left onto Kilkenny Ridge Trail/Unknown Pond Trail, go less than 0.1 miles, then turn right onto a path down to a clearing on the shore, where a magnificent view of The Horn over the dark water is gained. Return to the junction and continue on the Kilkenny Ridge Trail to a second viewpoint where you can see the water from a different angle. Now on the Kilkenny Ridge Trail, a 20+ mile path crossing the entire range, you hike over gradual terrain until the trail descends to a swampy area. The trail crosses the wet ground on bog bridges, then begins a moderate ascent, curving around the west side of The Horn. The trail eventually becomes fairly rocky, but never too steep. After 1.7 miles, in the col between The Horn and its higher (viewless) neighbor, The Bulge, turn left onto a 0.3-mile spur that ascends the summit cone of The Horn. The climb is easy at first, but involves some tricky scrambling near the top, including one exceptionally difficult hop just five feet away from the summit. Once there, you will be rewarded with a near-360 degree view of northern New Hampshire. To the east are the distant Mahoosucs. To the southeast are the Carter-Moriahs and Presidentials. To the south are nearby Mt. Cabot and The Bulge. Off to the west are very distant mountains in Vermont, and to the northwest are the ranges of Nash Stream Forest.